Over the past year at GDS, we’ve been working hard to create a strong technology community. Recently we took a day out of the office together. The GDS Technology community is pretty big – just over 90 civil servants and 50 contractors covering a range of specialisms and programmes. We’ve been growing fast too, with nearly 30 new joiners in the past 3 months. When you get to that size, it’s easy for people to lose sight of the bigger picture, miss chances to address shared challenges or learn from each other. The aim of the away day was to break down community silos, share knowledge and give people a chance to get to know each other. After kicking off the day with some introductions from our community leads, we had a series of short talks from 7 different teams. This included a talk from Michaela Benyohai about the principles of Registers, and the techniques they use for proving a register’s data integrity. Then, Jenny Duckett spoke about the work her team has been doing to improve GOV.UK links to local government services. Stephen Ford explained the GOV.UK Verify software packaging and deployment approach, and Rebecca Law spoke about how the GOV.UK Notify team use a combination of functional and end-to-end testing to ensure software quality. From the Digital Marketplace, we had a presentation from Kevin Keenoy on how they have designed software to allow content to be iterated rapidly. Finally, Dominic Jones from GOV.UK Pay explained how they use the container tool Docker to improve the developer and deployment processes. It was great to hear about all the work going on in our community, and to see technologists sharing a passion for their work and delivering benefits to users. what do we want to achieve together? It was important for everyone to feed into this discussion so our agreed goals and purpose are owned by everyone in the community. The exercise was also an opportunity to encourage new connections to form between people who don't usually work together. As part of my role on the GDS People Board over the past few months, I’ve used a set of facilitation patterns known as Liberating Structures to run engagement workshops. I’ve found these patterns to be really effective at engaging everyone in a group equally. For the icebreaker, I used one of the patterns called Impromptu Networking. The rules are pretty simple – people pair up for 3 rounds of 5-minute discussions. Every round, each pair discusses the questions: what do you want from the GDS technology community? And what can you offer? Importantly, participants are asked in each round to find a partner they don’t already know. People were clearly energised and enjoying the discussions judging by the increased volume levels as the exercise kicked off. We closed the exercise with a feedback circle where people reflected on the experience. People noted the pleasant surprise of finding similarities in their views and shared challenges that may otherwise have gone unnoticed. The point of this exercise was not to generate content – we weren’t trying to capture the outcomes of the discussions – but rather to seed new ideas, broaden people’s thinking, and start shifting energy and attention to the wider community. Next, to bring all this together, we used the 1-2-4-8-All pattern. This is a great way to get input from large groups really quickly. We asked participants what our top three community goals should be. Participants start with a few minutes of silent reflection to note their responses on index cards. Then the people form pairs, groups of fours and finally groups of eight to exchange their ideas and look for consensus. At the end of the exercise each group of eight fed back to the community highlighting their most important goals. The top priority for every group was our ongoing commitment to diversity. Other themes included breaking down team silos, and improving learning and career development opportunities. We reconvened for an unconference after lunch. This is another participant-led activity. Rather than having pre-planned speakers and sessions, there’s a blank schedule grid that participants are invited to complete. Anyone can propose a session, and they don’t need to be an expert on the topic to do so. For example if you’ve heard of Docker but not had a chance to use it, you could put forward a session on how to use the tool and invite people to share what they know. The proposer should be willing to facilitate the discussion, either by coming up with some specific questions or having some specific points to share. It was great to see how some of the sessions picked up on themes like learning and recruitment that were discussed during the morning’s goal-setting workshop. The picture above shows one of the sessions in action. We surveyed participants after the away day and received lots of positive feedback. The short talks had given participants an overview on the range of work going on in the GDS technology community. People also felt they’d gained a better understanding of our goals. There were some concerns that the format of the goals session led to more general goals rising to the surface and some more specific things getting lost in the process. Fortunately we gathered up index cards from the goals session so we could review the more specific areas. We haven’t been together as a technology community at this scale before. For many people it brought home just how much is going on and how many common challenges there are to solve. 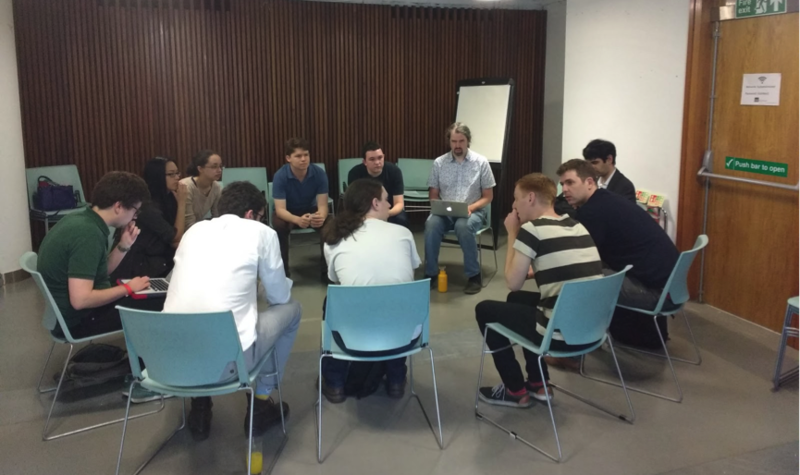 We’re now focusing on developing our learning programme, with internal events like ‘Technospectives’ (internal tech talks) and documenting our learning pathways linked to our technologist career path.